Your oral health is more important than you may think. The overall health of your mouth, teeth, and gums can greatly affect the rest of your body. 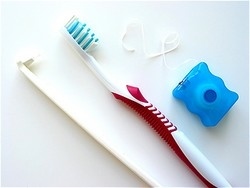 Good dental hygiene starts with scheduling a professional cleaning. Our hygienist will review your medical history, including any medications you are currently taking. Certain diseases, medications, and habits can predispose you to dental complications. This includes smoking and chewing tobacco. A thorough dental cleaning will remove any plaque and tartar from above and below the gum line. On occasion, this cleaning requires more than one appointment, depending on the extent of build-up. A periodontal exam is also completed to evaluate any problems with your gums and bone level around the teeth. Periodontal cleanings and treatments are also provided, if needed. Fluoride varnish is offered to provide additional protection from decay. Varnish can also be used to help alleviate any root sensitivity when applied to the root surfaces. There are no age restrictions to using a fluoride varnish. Sealants are offered to help protect the chewing surfaces of the teeth from decay. They use a bonding material to place in the pits and fissures of the enamel. This helps to keep food and bacteria from entering into these areas. Bleaching of the teeth is also an option for patients who would like a brighter smile. Different options are available based on the patient’s individual preference. This can be discussed at your hygiene appointment. Education is important for proper hygiene. Correct brushing and flossing techniques help to control plaque levels. Individualized at-home hygiene instruction helps to maintain healthy teeth and gums. At Kulick Dental, we strive to ensure you receive the highest level of service and quality. Your oral health is important to us. We can help you establish a dental hygiene routine that will keep your mouth healthy and happy.